DJI Mavic 2 Pro - Why is this the most anticipated drone? The best of both worlds is finally here!!! The DJI Mavic 2 Pro is a combination between the Mavic Pro and Phantom 4 Pro, which is something everyone’s been waiting for. Why is this a big deal? First of all, the compact size, image quality, flight time and sleek design of the Mavic Pro set the bar extremely high in the drone industry. Then the Phantom 4 Pro came along, sporting a larger 1” sensor, geared towards more professional photographers and videographers. The Phantom 4 Pro would be considered more of a professional use drone because of the camera, but the size would always come into play when it came to traveling with the P4Pro. The one wish everyone, including myself, was “Man wouldn’t it be amazing if we could have a 1” sensor on the Mavic Pro size body”? Fast forward a couple years, and we are finally here with the Mavic 2 Pro. The Mavic 2 Pro comes with all the standard equipment to get you up and flying. To take full advantage of the First Person View, you will need to provide your own mobile device or tablet. When it comes to image quality, low light performance and adjustable aperture, the larger 1” sensor goes a long way as a photographer and videographer. This camera can shoot 20mp photo and 4k video. You have the ability to capture more light, increase your dynamic range and produce higher quality and larger image sized photos. Not to mention, DJI partnered up with the well-known Swedish camera manufacturer Hasselblad, and this camera is the first of it’s kind to come out since this news occurred over two years ago. After shooting images side by side with the Mavic Pro and Mavic Air, the camera quality difference is very clear. Also, the 28mm lens gives a really nice perspective compared to the wider 24mm on the Mavic Pro. With all that new technology and camera upgrade, it’s hard to believe that DJI was able to maintain the same form factor and size as the Mavic Pro. As you can see in my side-by-side comparison video, the size of the Mavic 2 is just about the same as the Mavic Pro. I can’t even imagine the trial and errors the engineering team at DJI had to go through to pull this off. 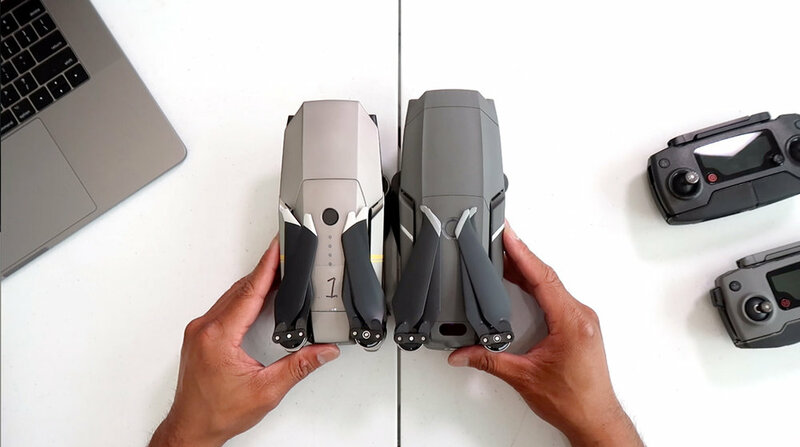 The footprint of the Mavic 2 Pro is only about a half-inch difference in the front of the drone. While there is a weight difference between the two (Mavic Pro 734g / Mavic 2 Pro 907g), it’s good to know that DJI also increased battery life to 31 minutes. The Mavic 2 Pro has Omnidirectional obstacle sensing which assists flyers when using ActiveTrack and Tripod mode. As if the camera upgrade wasn’t enough, I feel like that Omindirectional Sensing is a huge bonus for this drone. Even though side sensors were present on the Phantom 4 Pro, I didn’t expect to see them on the Mavic 2 Pro. Not only did DJI add side sensors, but also they added top and bottom infrared sensors to assist in tight spaces and upward movement. DJI included 8GB of internal storage just like the Mavic Air, which I find to be a lifesaver when I forget to bring a memory card. 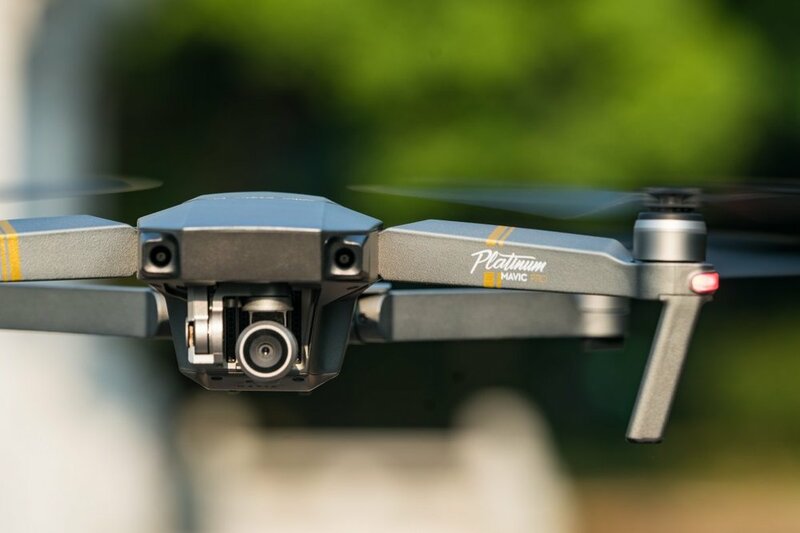 The Mavic 2 Pro now uses the latest OcuSync 2.0, giving the pilot 8km Fill-HD Video transmission. I never really plan on flying that far out, but it’s good to know that DJI has tested it at those ranges. I’m extremely excited about the new T/P/S mode switch on the side. This allows the pilot to go from flying fast with (S – Sport Mode) to extreme slow motion (T – Tripod) in a matter of seconds. ActiveTrack 2.0 is now enhance with trajectory prediction, which means it’s updated 3D mapping system helps reduce the lose of a target during ActiveTrack. This is a big deal for those outdoor adventurers looking to how the M2P follow them through dense environments. Two new Smart capture modes that DJI introduced with the Mavic 2 is Hyperlapse and Point of Interest Vision. The two unique ways of capturing footage can really add value to your story. Hyperlapse is the next level of timelapse photography. With one click, you can now do an aerial timelapse with custom flight patterns, all programmed from the DJI 4 Go App. I’m really excited about the new Vision Point of Interest mode for a couple reasons. The updated user interface is very intuitive and allows you to make radius, height, speed and directions changes quick in easy in the app. Vision POI is perfect for landmarks, events or other situations where flying directly over a person or subject is not safe or allowed. Being able to fly up and select what point you want to fly around makes setup and fly super fast and reliable. Who is this Drone for? If you are a serious hobbyist, photographer, videographer or traveler looking for the most portable, highest quality drone and camera then look no further. The compact size makes for easy packing in any backpack or camera bag and the ease of setup makes getting up in the air quicker and safer. As a photographer first flyer, the Hasselblad camera and 1” sensor is something I’ve been waiting for a very long time. It still seems unreal how far the drone industry has come in the past few years, and once again DJI continues innovate with the new Mavic 2 Pro. So the newly updated DJI Mavic Pro Platinum is announced. Let's get straight to the point with the main differences between the Mavic Pro and Platinum. So why didn't they upgrade the camera? Well in my opinion, they still want and need to keep the platforms separate. Higher-end prosumer drones like the Phantom 4 Adv / Pro and Inspire 2 offer the 1 inch sensor. The size of the gimbal and camera simply wouldn't fit with the current Mavic design and build. I do think it will head in that direction next year, but this update reminds me of the iPhone and iPhone S versions. If it ain't broke, don't fix it. The original Mavic Pro is almost perfect (for the size). It's an absolute beast packed into a small package. I do want to take a closer look to see if they did anything with the gimbal. The flimsiness of the Mavic gimbal is always concerning. So if they didn't update the camera, I would hope they at least reimagined the gimbal but I don't think they did. If I already have a Mavic, is it worth upgrading? I think if you have a Mavic already, you should be able to answer that question. And I say that because everyone's usage is different. I use my Mavic like a work horse and it's my go to drone, so I personally think it could be worth it. But if you aren't too serious and only fly occasionally, this is most likely an update you can skip. Drones are just flying cameras and simply a tool. Just like a DSLR, if you don't bother to use it for it's full potential, then don't bother. Wow, it's quieter!!! Is that a big deal? If you fly a lot, YES!!!! It's a HUGE deal. I recently flew in Cabo San Lucas at the beach and can barely hear my Mavic Pro. At the same time, a Phantom 4 flyer was flying at the same down way down the beach shooting a wedding. I could hear his Phantom from all the way down the beach and I could barely hear my Mavic which was right in front of me. So the quieter, the better in my opinion and it definitely does make a big difference in public. If you were in the market for a Mavic, then you scored with this update. 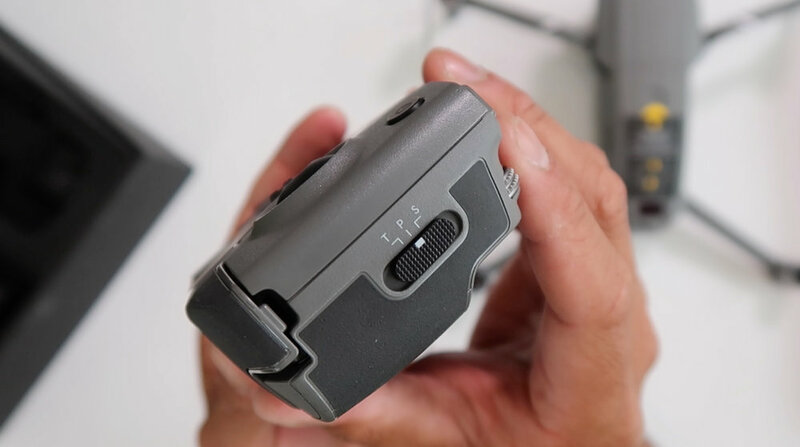 You are now getting a fine tuned machine that has been through the ringer for the past year and this new one most likely address all the small issues the Mavic Pro originally had. If you currently have a Mavic and are thinking about upgrading, only you will know if it's worth it. Don't upgrade just to get the new shiny piece of tech. I'd say upgrade if you really understand the benefits and you are a true user of the product and see the benefits of the battery life and noise reduction. If you are in the market for a Mavic, you can score the original Mavic Pro for a discount. I'm sure lots of people will off load their current Mavics to upgrade so swoop in on these deals. If you can get a Mavic Pro for a couple hundred off, then you've scored a hell of a deal. Hope this helps everyone. For more info on the Mavic Pro Platinum, click here.